February 15, 2019 – The Pagkilala sa Natatanging Kontribusyon sa Bayan (Panata Ko sa Bayan) Awards of the Department of Social Welfare and Development (DSWD), awarded the Best Non-Government Organization (NGO) representing Luzon to the SPUP Community Development Center Foundation, Inc. today at the Landbank of the Philippines Auditorium in Malate, Manila. The Panata Ko sa Bayan Award aims to acknowledge and recognize the invaluable support of individuals, groups, and organizations who have generously shared their time and resources, in helping the Department carry out its mandate of improving the lives, as well as provide a better opportunity for the poor, vulnerable, disadvantaged, and marginalized sectors. The award was received by Ms. Noemi T. Cabaddu, Chairman of the Regional Area-Based Network (RAB) and Executive Director of the SPUP Community Development Center Foundation, Inc. and Sister Merceditas Ang, University President of the SPUP with assistance from DSWD Field Office 02 Regional Director, Leonardo C. Reynoso. The NGO first received Level 1 accreditation from DSWD Field Office 02’s Standards Section in 2016, which is mandatory for licensed Social Welfare and Development Agencies (SWDAs) to ensure quality in the delivery of their programs and services targeting vulnerable sectors of their community. The Level 1 accreditation is valid for three (3) years and failure to get accredited can be ground for the revocation of the license of SWDAs. The SPUP Community Development Center Foundation, Inc. received their Level 2 accreditation last October 22, 2018, passing the mandatory requirements as set in level 1 along with more stringent requirements along the five (5) work areas of standards in the accreditation namely: Administration and Organization, Program Management, Case Management, Helping Strategies/Interventions and Physical Structures and Safety. * To maintain the privacy of the individuals mentioned in this article, their names were changed. It is easy to love people when things are going well, and the outlook seems rosy all the time. When things and circumstances turn for the worse however, so is the attitude and the lack of love that is apparent. This makes Jhun and Marie’s story impressive. The couple has been living for four years together but were not blessed with a child. Despite this, they made efforts to try to build their own house hoping that it will be ready in time for a child that could complete their lives. They purchased a land and though their house was eventually made with light materials, the couple aspired to one day build a house worthy of the family that they aspire to have. But Christmas came early one day six years ago, when Jhun was given a newborn child from a mother who, fearing she wouldn’t be able to provide for the needs of her baby, decided to give the child to a couple that would be able to. “Masaya ako nung una ko siyang makita. Naramdaman ko agad na siya na yung hinihintay namin para mabuo pamilya namin,” Marie recalled. The child who became the embodiment of all the couple hopes and dreams for, eventually filled the gaps missing from the couple’s marriage. They became the child’s foster parent with the assistance of DSWD. “Anak na ang turing ko sa kanya noong una ko pa lamang siyang makita. Minahal na namin siyang agad,” Jhun added. But the positivity and the radiance that the child brought somehow turned to challenges later, however. The child experienced illnesses such as Acute Respiratory Infection at just 7 months old, Atopic Dermatitis at 3 years of age, Impetigo at 4 and again at age 6 and Pneumonia at 5 years in addition to all the normal sicknesses that a child experience. The couple nonetheless took these as opportunities to develop as parents and not a blockade in line with DSWD’s mission of protecting the vulnerable and the disadvantaged. As if these experiences weren’t already enough, the child was diagnosed with Gross Developmental Delay at just 11 months. For ordinary individuals, the news would’ve been devastating specially in a culture that prefers perfection in almost everything, even the children that we care for. But not for Jhun and Marie. They considered the diagnosis as a temporary setback in their road to happiness and contentment. The couple started bringing the child to twice a week physical therapy at the Cagayan Valley Medical Center (CVMC). Years of therapy bear fruit as the parent’s determination led to incremental development in the child’s motor function. At 16 months, the child could already hold her bottle with her hands unassisted. At 32 months, she developed even further by being able to raise her hands, achieve head control and sit with some support. “Hindi natin mapipili ang mga nangyayari sa atin. Yung sitwasyon namin kay Angel, tinatanggap namin ng buo dahil ito ang binigay ng Diyos sa amin. Biyaya siya sa amin. Mamahalin namin siya at aalagaan sa abot ng aming makakaya,” Jhun said. At 4 years of age, she was brought to a Stimulation and Therapeutic Activity Center (STAC) after referral by a social worker to continue her therapy. At five years of age, the child was able to minimize the use of her wheelchair and shifted to using a stationary chair instead. Now at six years old, the child still relies on her parents when being fed. She also still cannot indicate her bladder and bowel needs and still unable to dress and undress herself. Despite all these challenges, the parents are hopeful because their love for their foster child is greater than the problems they face. They make sure to work together to give all the needs of their child. Making them stronger is the fact that the child can now utter words such as mama, papa and dede. She also shows cognitive development by being able to identify colors, shapes, numbers and animals by pointing. They are also preparing for the future of the child as they started a small broiler buy-and-sell business in 2016. The couple jointly manages their business and hopes to one day expand their business to include home-for-rent opportunities. “Gusto ko po na gamitin yung lupa na nabili namin para magpatayo ng bahay na pwede naming ipaupa sa iba. Sa ganoong paraan, mas makakaipon kami para sa kinabukasan ng aming anak,” Marie said. With the help of the Adoption Resource and Referral Section (ARRS) of the Department of Social Welfare and Development Field Office 02 (DSWD FO2), the couple are now finalizing all the documentary requirements to process the legal adoption of the child. Ms. Rosario Corpuz, Social Welfare Officer II and Head of the ARRS, said that the diligence of the couple in meeting the requirements needed would lead to the swift processing of the adoption. “Nakikita natin yung pagpupursige nila para maibigay ang mga kailangan para sa adoption. Kapag nakumpleto lahat ito, maaari na nating maipasa para maproseso na ang kanilang adoption,” Ms. Corpuz said. Aside from the legal requirements for adoption, the couple capacitates themselves to improve their rearing skills, with Marie recently attending the National Training on Capability Building for Foster Parents in Davao City last July 24-27, 2018. “Natutunan ko sa training kung papaano alagaan ang mga batang kagaya ni Angel. Mas naiintindihan ko na ngayon yung mga kailangan niya kaya ako ay masaya na napasali ako sa training. Magagamit ko ito para sa preparasyon ko para sa adoption kay Angel,” Marie said. With the couples’ continued development as parents, their plans for adopting the child moves one step closer to becoming a reality as the days pass. Indeed, love knows no limits. Tuguegarao City – Staff from the Department of Social Welfare and Development Field Office 02 (DSWD FO2) joined a team that also includes members coming from the Department of Health (DOH) and the Office of Civil Defense (OCD) in the conduct of Rapid Damage Assessment and Needs Analysis (RDANA) in the provinces of Isabela, Quirino and Nueva Vizcaya. The endeavor, which started last November 1, 2018, had the group divided into 4 teams, with two teams assigned in the provinces of Quirino and Nueva Vizcaya, another team to the coastal Isabela towns of Dinapigue, Divilacan, Maconacon and Palanan and another team assigned to conduct RDANA to the rest of the municipalities of Isabela. To date, three teams have already finished doing their assessments while the team assigned in the coastal towns of Isabela is awaiting the chopper that would fetch them and take them back to Tuguegarao City. The OCD, again in partnership with the DSWD and DOH, will conduct a post-RDANA meeting today, November 5, 2018, to discuss the results of the RDANA and come up with plans for the rehabilitation of affected areas. According to the latest report coming from the Disaster Response and Management Division (DRMD) of the field office, there are 17,119 partially-damaged houses and 1,857 totally damaged houses in the region. The consolidated data comes from reports of different local government units (LGUs). Reina Mercedes, Isabela – Shekina Glorie Sario’s thoughts were to go home Monday evening to be with her family as Typhoon Rosita began its onslaught in Isabela Province, knowing how hard it is to leave family members during disaster situations. But as it is when it comes to disaster situations, she chose to stay in the Municipal Action Team (MAT) office to monitor the situation and consolidate reports that would be needed for submission to the DSWD Regional Office. “We needed to sacrifice in the name of public service. Kinailangan nating isakripisyo ang oras at panahon natin para mabigyan ng serbisyo at tulong ang ating mga kababayan sa Reina Mercedes,” Ms. Sario mentioned. Aside from conducting visitation and helping the local government unit (LGU) in assessing the needs in evacuation enters to ensure the welfare and protection of evacuees, the MAT team also led the distribution of relief goods to affected families and individuals. “Kahit basang-basa sa ulan, isinakripisyo natin ang ating panahon at oras na para sana sa ating mga pamilya para makapagbigay ng sapat na serbisyo sa mga mamamayan ng Reina Mercedes,” Ms. Sario added. During the typhoon’s peak, a total of 12 evacuation centers across 14 barangays were opened in the municipality, thereby guaranteeing that the MAT’s hands were full when it comes to responding to the needs of the evacuees. A total of 443 families including 1,615 individuals were affected in the municipality as of the latest report coming from the field office’s Disaster Response and Monitoring Team (DMRT). To augment the needs of affected families in the area, a total of 200 family food packs were distributed by DSWD directly to affected families. Despite all of these, Ms. Sario and the rest of MAT Reina Mercedes stayed true to their mandate of quick and prompt service even when it means sacrificing sleep and rest to get the job done. “Basta mabigyan natin ng serbisyo ang ating mga kababayan, kaakibat man nito ay pagod at puyat. It is fulfilling to help people without hoping for anything in exchange,” Ms. Sario concludes. Gonzaga, Cagayan – Ngiti ang namutawi sa mga labi ng mga batang tumira sa Gonzaga People’s Gym, Gonzaga, Cagayan na nagsilbing evacuation center sa lugar noong nanalasa ang Bagyong Rosita. Lunes ng gabi ng magsimulang magparamdam ang Bagyong Rosita dahilan para ilikas ng Local Government Unit (LGU) katuwang ang Municipal Action Team (MAT) ng Department of Social Welfare and Development (DSWD) na nakatalaga sa lugar ang mga residente ng Barangay Caroan, Barangay Cabanbanan Norte, Barangay Minanga at Barangay Pateng dahil na rin sa banta ng malakas na hangin na maaaring magdulot ng mataas na daluyong ng tubig. Aktibo ring tumulong ang MAT Gonzaga sa pangangasiwa ng pamamahagi ng mga pagkain para sa mga apektadong pamilya sa evacuation center. Dagdag pa rito, naglagay din ng telebisyon upang maaliw ang mga tao. Hindi naman alintana ng mga bata ang bagyo na nananalasa dahil napanatiling protektado ang evacuation center. “Sa anumang oras, ang DSWD staff ay handa, maagap at maaasahan upang malagpasan ang anumang sakuna sa pamamagitan ng sama-samang pagbibigay ng serbisyo at kalinga na siyang nagpapakita ng tunay na pagmamalasakit at pagmamahal sa kapwa,” pahayag ni Karen Kaye Macapulay, Municipal Link ng MAT sa lugar. Patuloy pa rin ang ginagawang pagbabantay ng MAT Gonzaga para sa mga naapektuhan ng Bagyong Rosita. Penablanca, Cagayan – Taking advantage of fair weather conditions since the departure of Typhoon Rosita in the region, the Cagayan Valley Regional Disaster Risk Reduction and Management Council (CV-RDRRMC) led by the Department of Social Welfare and Development Field Office 02 (DSWD FO2) conducted the 1st Response Cluster Meeting for Typhoon Rosita in Valley Hotel yesterday. 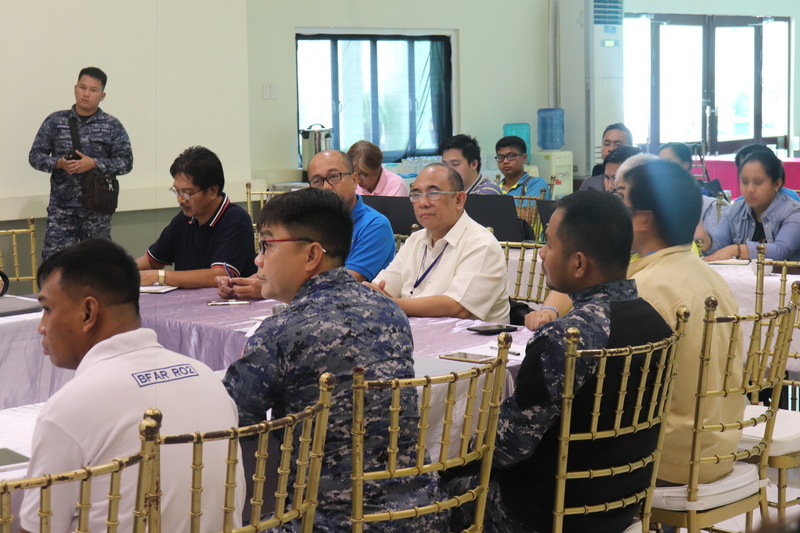 The meeting was conducted for the office to provide information to members of the CV-RDRRMC the updated number of families and individuals affected by the typhoon throughout the region as well as the assistance given by the agency to those who were affected. The presentation of the agency’s report was done by Mr. Franco G. Lopez, Head of the field office’s Disaster Response and Management Division (DRMD). The gathering was also done to consolidate reports coming from various line agencies for the provision of a more efficient service to regional constituents. DSWD FO2 Regional Director Leonardo C. Reynoso in his speech expressed his gratitude to council members for the prompt response to the needs of affected people while assuring that an additional 23,700 family food packs will be procured by the field office as soon as possible for augmentation purposes. As per the report given by the Philippine National Police (PNP), minimal casualty was reported as a result of the typhoon, a testament to the shrewd preparation made by the council to prepare for the typhoon.